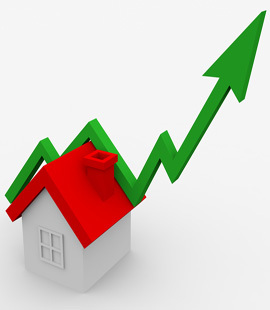 Home prices are above the highest levels. And the force pushing them to new highs is losing strength. The next housing collapse is on the horizon. Eventually, home prices must return to normal levels. That's why I've uncovered two ways to profit from the correction. The 30-year fixed-rate mortgage topped 18% back in the '80s. But today, it's closer to 4%. So you can borrow money at a 70% discount compared to a few decades back. The artificially low rates have prompted folks to borrow money to buy homes. And now, the fear of rising rates is pushing a final buying spree. As interest rates rise, borrowing becomes less attractive. That's why mortgage brokers are encouraging home buyers to lock in low rates today. A rock-bottom interest rate is the main culprit behind the housing bubble resurgence. It's spurred sales and pushed home prices above precrisis levels. But now, the Fed is slowly turning off the cheap money tap. The new housing bubble can't be sustained as cheap debt disappears. Buyer demand will fade. And this is just one reason to be cautious. Lending standards are a little better today than they were in the early 2000s. But they're still not great. Lenders and brokers still have plenty of ways to pass the buck. Mortgage brokers work on commission. Their job is to close sales whether or not those sales are financially sound. When a broker sells a house, the mortgage on that house is often repackaged into a security with other mortgages. Then, it's sold to other investors. So the risk is passed on to the next guy. With over 60 years in the Building Industry, Overstock Building Supplies strives to be the one stop shop for quality doors at a competitive price. We hold ourselves and our employees to the highest level of integrity. We will go the extra mile to make sure our customers receive the right product at the right price. Home owners, builders, interior designers, carpenters and people of this trade can trust us to deliver magnificent doors at a great price. © Overstock Building Supplies. All Rights Reserved. Unauthorized use of any images, thumbnails, or editorial content without written permission is strictly prohibited. Prices are subject to change. Subscribe to OBS mailing list to receive information on new arrivals, specials and discounts.